As 2014 draws to a close so does the final chapter on Irex Technologies, one of the early ereader makers. Public documents confirm that IRX was handed over to a receiver in October 2014. According to reports filed about a month later, the company is kaput. It's not clear what will happen to the assets, but the company won't be coming back under a different name. (Thanks, Huub!) Its website has been turned off, and all of the employees have probably found jobs elsewhere. And that's a shame, because IRX was working on some interesting screen tech. Currently, the IRX team is developing a new innovative color solution built on their electro-osmotic technology for electronic paper displays, that places three switching layers on top of each other. Each layer can electrically switch to its required color (cyan, magenta or yellow) or be 100% transparent. So for example, for a white image, all three layers become transparent. Light passes through all the layers and is reflected by a reflector placed behind the layers creating extremely high brightness, far greater than is possible for current systems. When creating a certain color, the technology controls the required amount of color particles in each of the layers. The result is a color performance comparable to printed paper. That sounds neat, but I haven't found any evidence that IRX ever got beyond displaying a single color (that's why I haven't written about them). While there was some talk of 3-color screens at SID Display Week 2013, the only videos posted to Youtube show show grayscale screens which look similar to E-ink screens. So at this point it's really not clear whether this 3-color electro-osmosis screen tech ever actually existed in the lab, much less had any practical value. And thus ends the second life of an ereader pioneer. In its first life, IRX got its start as a project at Royal Philips (aka Koninklijke Philips, or simply Philips). 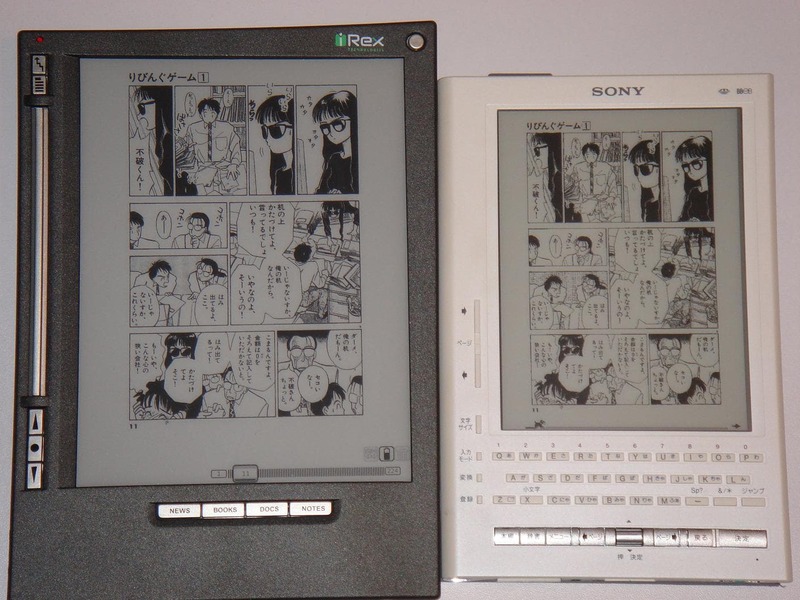 Philips was instrumental in developing the 6" E-ink screen for the Sony Librie, which launched in Japan in 2004. That R&D effort also led to the development of an 8" display which had a screen resolution of 1024 x 768 (the same resolution as on the Cybook Ocean). Irex was spun off of Philips with the plan to develop an ereader based on that screen. The Irex Iliad ran an open version of Linux on a 400MHz CPU with 64MB RAM and 256MB internal storage. It didn't have a frontlight (this simply wasn't possible in 2006) but it did have a Wacom touchscreen and Wifi. According to Wikipedia, the Iliad cost 599 euros when it shipped in 2006. While it had software ahead of its time, the Iliad was in some ways a clunker with a hardware design that didn't quite live up to its promises (battery life, for example), although the later models with revised hardware did come close. I can recall from the user reports in 2007 and 2008 that it was much more of a hacker's project than a consumer product; the more interesting reports all came from the developers who added their own software or tweaked Irex's software to improve performance. Irex's later products were much better, although I'm not sure they were as popular. Irex released several more ereader models before going bankrupt in 2010. In what would be better termed as a reorganization, the assets were bought by IRX Innovations and all of the existing employees keeping their jobs. This is sad news. In my quest for the perfect digital notebook, I have owned all Irex e-reader models (various Iliads, DR800, DR1000). I found them all to be remarkable in terms of design, both on the hardware and the software side, with a lot of creative ideas. The large screen sizes, the use of Wacom technology, and the open software were ahead of their time. I wonder how things would have turned out if they had received FCC approval to sell the devices in the U.S. before they ran out of cash. Regardless of the venture’s ultimate failure, those guys have my respect! That would have changed very little. Remember, the iPad launched in 2010 and killed the market for large screen ereaders. The iPad killed a Samsung 9.7″ ereader as well as the Plastic Logic Que, and I’d bet it also killed Irex. But even if it hadn’t, Irex’s own ineptitude would have done so. This company screwed up its FCC paperwork.If they hadn’t made that mistake they would have made another. Yet we still have companies like Onyx and Pocketbook selling e-readers that are often inferior to the Irex products of 5 years ago. Somehow they managed to survive, without even selling on the U.S. market. Interesting, I didn’t know that. Do you have any sources for that info? Well, FCC changed rules during the game. After Amazon launched its 3G equipped ereader as a ‘mobile device’, when IREX tried to approve theirs, FCC came up rules for a new product group. As this process took a few months, IREX missed their end-of-year launch window, and in turn, investors funding. Yes, but the thing about Onyx and Pocketbook is that they also make smaller ereaders as well as other devices. Irex only made big stuff, putting them in the classic position to be disrupted by a better device. This is sad. My first eReader was an iRex Iliad and the only eReader I ever owned that would smartly handle PDFs display. At the time, it cost an eye, though. But the product was close to perfect (even though it would be a bit heavy compared to nowadays eReaders). I actually didn’t even know they had survived 2010!